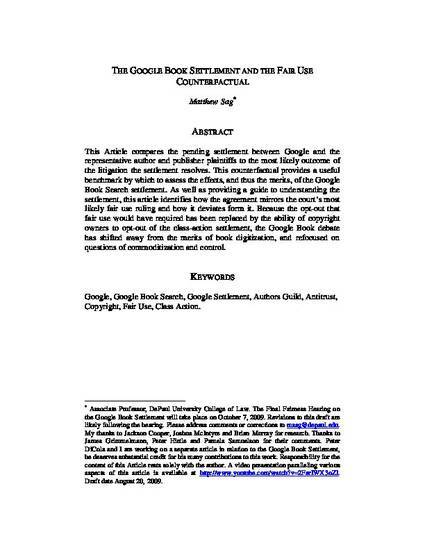 "The Google Book Settlement And The Fair Use Counterfactual"
This Article compares the pending settlement between Google and the representative author and publisher plaintiffs to the most likely outcome of the litigation the settlement resolves. This counterfactual provides a useful benchmark by which to assess the effects, and thus the merits, of the Google Book Search settlement. Google was never likely to receive the courts unqualified approval for its massive digitization effort. In fact, the most likely outcome of the litigation was that book digitization would qualify as a fair use subject to an opt-out. Accordingly, the aspects of the proposed settlement which allow Google to continue to operate its book search engine in its current form should not be controversial; they essentially mirror the court’s most likely fair use ruling if the case had gone to trial. In effect, the opt-out that fair use would have required has been replaced by the ability of copyright owners to opt-out of the class-action settlement. This conclusion explains why, in the wake of the proposed Settlement, the Google Book debate has shifted away from the merits of book digitization, and refocused on questions of commoditization and control. This Article highlights four critical areas in which the Settlement differs sharply from the predicted fair use ruling. First, the Settlement permits Google to engage in a significant range of uses including the complete electronic distribution of books that go well beyond fair use. Second, the Settlement provides for initial cash payments by Google to the copyright owners and a fairly generous revenue sharing agreement, neither of which would have been required under a fair use ruling. Third, the agreement creates a new set of institutional arrangements that will govern the relationship between Google and the copyright owners covered by the Settlement. The foundations of this new institutional framework are the Settlement agreement itself, the creation of a collective rights management organization called the “Book Rights Registry” and the “Author-Publisher Procedures”. The fourth area in which the Settlement differs from the likely fair use outcome relates to the accessibility, commoditization and control of orphan works.